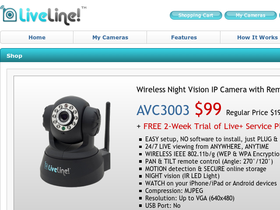 LiveLine.com is an easy-to-use home surveillance system that allows you to monitor your cameras from anywhere in the world over the Internet. LiveLine features live monitoring over the Internet; live monitoring over mobile phones, motion detection, day and night monitoring, automatic recording, e-mail alerts, and more! There is no software to install. All LiveLine features can be accessed through your standard Internet web browser. Save on your next purchase with LiveLine discounts, LiveLine coupons and LiveLine savings from 58coupons.com. Sign up at LiveLine.com and receive your first month of service for free. Click link to view. Sign up now and your monthly service fee is only $9.99 at Live Line. Click link to get started. At LiveLine.com pay no sales tax on your purchases unless you live in CA. Click link to get started.